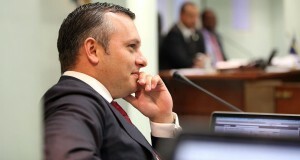 WILLEMSTAD – There was a serious case of mismanagement at both the public companies Aqualectra and the Refineria di Korsou (RdK), which is the Curaçao Oil Refinery, during the Schotte-cabinet. This is the conclusion of the civil investigation into the policy and affairs of both companies. The mismanagement was caused entirely “because politics has directly interfered with the operations of both companies.” Aqualectra is therefore currently almost bankrupt. This was reported by researcher Huub Willems in his opinion, which was published by the Dutch newspaper Amigoe. In the report, it can be concluded that in this case there are no legal offenses, but facts that are contrary to good governance or public interest. Also, it can be concluded that the mismanagement caused by the then government headed by Gerrit Schotte ultimately became a heavy burden for the people. The bill was or is still being paid by the community. The government will have to act against this since there was no criminal act for the Public Prosecution to investigate and prosecute.